On August 18, 1227, Genghis Khan, the legendary Mongol leader who ruled an empire of a scope seldom matched by anyone else in history, died in camp during a military campaign. The exact cause is unknown, but the 65-year-old was in failing health and it has been claimed (perhaps dubiously) that he may have taken a nasty fall from a horse, worsening his condition. Born the son of a small-time Mongol chieftain around 1162, a young Temüjin, who would become Genghis Khan, had already grown into a force to be reckoned with by the time he reached his teens. He first proved his mettle when his wife, who he married when he was 16, was kidnapped by a rival tribe and he managed to rescue her. After this, he found it relatively easy to attract followers and forge alliances. 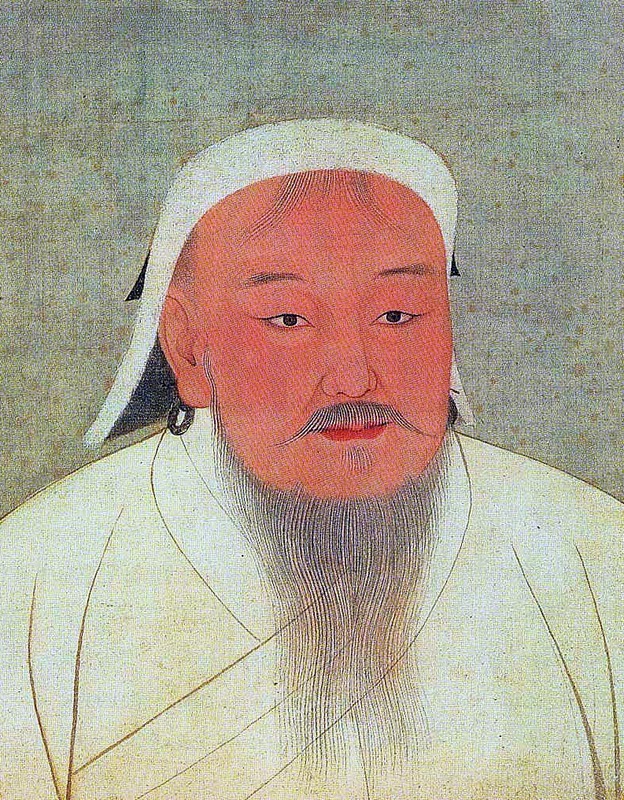 As his star rose, Khan ultimately made it his business to unite the Mongol clans. Many agreed to do so voluntarily, but those that didn’t were conquered and assimilated into Khan’s growing number of subjects. By 1206, Genghis Khan, meaning “Oceanic Ruler” or “Universal Ruler,” was leading a nomadic and formidable army that was rapidly moving against China in massive numbers. Most cities and armies simply crumbled in the face of such an onslaught; Khan’s forces didn’t exactly rock them to sleep once he conquered them either. For instance, it’s believed he ordered the massacre of about three-quarters of Iran’s population. During the invasion of the Khwarezmia Empire, a mass beheading of civilians – men, women, and children – was reported, with the heads stacked in a pyramid shape. As horrifically cruel, ghoulish – and common – as this behavior was, those who did survive a visit from Genghis Khan and his buddies enjoyed a surprising measure of religious freedom and the protection of being part of the ever-growing, and prosperous, Mongol Empire. In fact, Christians, Muslims, and Buddhists, among others, were all welcome under his rule. It was also said that a man could walk unarmed from one end of the Mongol Empire to the other with a gold plate on his head and never be accosted. In the end, while Khan’s forces were putting down a rebellion in Xi Xia, he died… but not before he ordered that Xi Xia be wiped off the face of the planet. As such, his heirs made sure this particularly enemy suffered a bloodbath worthy of the dearly departed Khan, and then some. He also requested that his final resting place remain a secret. Because of this, a legend sprung up that his dutiful heirs slaughtered anyone who happened upon his funeral procession, then all the guests, and finally all the soldiers who accompanied and buried Genghis Khan’s corpse. Whether this actually happened or not, Khan’s final resting place is something of a mystery today.